Sean Dyche made a number of personnel changes and a formation change for our game at Stoke but the one thing that didn’t change was the result as the Clarets fell to yet another away defeat, losing 2-0 to two first half goals. By the time I left home yesterday morning the team had all been confirmed. Jon Flanagan was in for Matt Lowton at right-back, Scott Arfield returned for the injured Johann Berg Gudmundsson while the return to 4-4-2 saw both Ashley Barnes and Andre Gray come in for Steven Defour and Sam Vokes. It certainly proved to be a discussion point on the short journey to the Potteries, via our now favoured lunch stop in Cheshire. I’d like to say it was an easy journey down, and in terms of traffic it was. However, we were very fortunate not to get caught up in what might have been a serious problem on the M6 as the car in front of us suddenly swerved all over the place with the driver appearing to be virtually out of control. The problem was a wheelbarrow that had somehow found itself in the middle lane. I’m not sure if there were any accidents because of it and I’ve certainly no idea how it got there, but a quick call to the Cheshire Police received a response of: “We’re aware of it,” although not offering any suggestions as to what they might do about it. Parked up early, we were inside the newly named bet365 Stadium in good time with the players of both sides still warming up and took up our standing position some 25 rows back directly behind the goals. Stoke had a couple of guests on the touchline before the game. One was an ex-player but the other was Neil Baldwin, aka Nello, the former kit manager who became so well known a couple of years ago because of the BBC film Marvellous in which he was played by Toby Jones. He’s certainly become a celebrity with the Stoke fans since the film was shown. The teams came out with Burnley wearing their full away kit, the sky blue shirts with the navy blue and claret shorts and socks, with the game preceded by an immaculately observed minute’s silence in memory of those who lost their lives this week in the Columbian plane crash, the only noise coming from the concourses where they would have probably been unaware of it. The game started and it was all Burnley for the opening minutes. Defending the goal just in front of us, it wasn’t really possible to see our penalty claim for handball from a free kick but it was a bright start that could so easily have given us an early lead. It didn’t; the game remained at 0-0 and eventually it all changed with the home side getting the upper hand and beginning to play in such a way that you began to wonder how on earth they’d started the season so badly. Bruno Martins Indi hit the post with less than ten minutes gone and that warning really did lead to a period when it was Stoke in total control and they eventually went in front in the 20th minute when a ball in from the right was met by Mame Biram Diouf was met by Jonathan Walters who got a touch on it to loop a shot over Paul Robinson and in via the far post. We didn’t suggest we were going to get back into the game but the second goal left a very sour taste in the mouth as we saw Stoke at their very worst. There was no problem with the goal; that was really well taken by Marc Muniesa, but their antics before and after the goal were very poor indeed. It all started when we put the ball out of play for them so Charlie Adam could receive some treatment. Stoke, very unsportingly, returned the ball by hitting it into our left back corner for a throw in. We never really got the ball away again and when Stoke switched it to their left, Marko Arnautovic beat Flanagan far too easily and crossed low for Muniesa to finish well. Was there really any need for Arnautovic to then bait the Burnley fans with unnecessary hand movements among other things? Burnley already looked a well beaten side and I think we were relieved to get in at half time with only a two goal deficit although Jeff Hendrick did force former Claret Lee Grant into his first save just before the break. One of the major failings away from home this season has been the way we’ve stopped competing once going two behind. I felt that was certainly the case at Leicester, Southampton and West Brom. This time, to our credit, we might not have got back into the game but we did give it a really good go in the second half. Stoke will say the game was won and they just let us have the ball, but I don’t believe that was the case and they could have found themselves in a more difficult game on a couple of occasions had that been their intention. The one incident we’ll all talk about was Muniesa pulling back Gray as he tried to break clear of him. It seemed to go on forever before referee Mark Clattenburg pulled it back. At the time I thought it should have been a red card but from a position behind the goal I appreciate you are focused so much on the incident it’s possible that other defenders could have been covering unnoticed. I’ve since seen it again and for the life of me I can’t see how it’s not a red given he’s given the first of the offences long before any defender could have got close to a covering position. 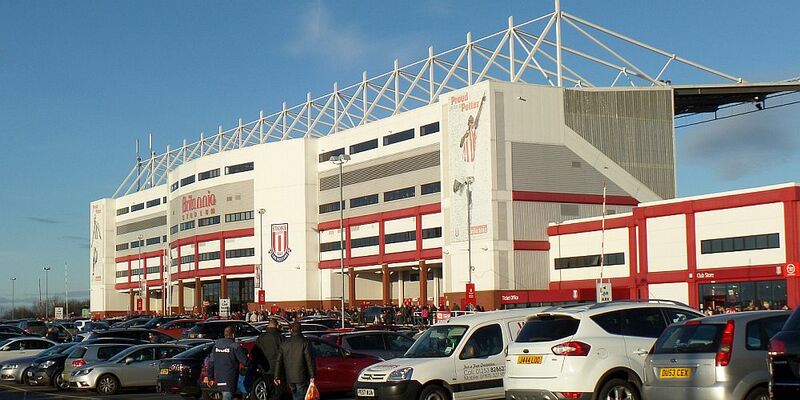 The free kick came to nothing but significantly Stoke were able to continue with eleven players on the pitch. The Sky commentary team, sometime later, were demanding a red for Barnes when his elbow made contact with as Stoke player. I thought at the time it was accidental and still do. I’d be amazed if anyone sought to take any action against Barnes despite Sky’s constant coverage. Gray, who looked a bit rusty, and that’s no surprise, saw Grant save from him right at the end but in truth we didn’t really threaten too much to get back into it when two goals were needed. We can have no complaints at the result. It has, of course, led to more overreaction. One poster on the message board wanted Dyche out and then said he wanted to get back to the Championship where we won more games. It’s the same after every game and I’m sure they have no idea how tough away games, in fact all games, are in this league. Someone at the ground suggested we should be matching Stoke at this level, believing that the clubs were very similar in size. I did point out that this is Premier League season number nine for Stoke who receive huge financial investment from the Coates family and bet365. The battle continues, and that’s what it is, a battle to try and get the points we need to stay in the division. And I’m sure we’ll pick up more points on the road soon. Stoke: Lee Grant, Glen Johnson, Bruno Martins Indi, Marc Muniesa, Erik Pieters, Gianelli Imbula, Charlie Adam (Glenn Whelan 87), Mame Biram Diouf, Xherdan Shaqiri (Joe Allen 61), Marko Arnautovic (Peter Crouch 71), Jonathan Walters. Subs not used: Shay Given, Ramadan Sobhi, Bojan Krkic, Wilfried Bony. Yellow Cards: Marc Muniesa, Gianelli Imbula, Mame Biram Diouf. Burnley: Paul Robinson, Jon Flanagan (James Tarkowski 81), Michael Keane, Ben Mee, Stephen Ward, George Boyd (Sam Vokes 77), Jeff Hendrick, Dean Marney, Scott Arfield (Michael Kightly 90), Ashley Barnes, Andre Gray. Subs not used: Nick Pope, Matt Lowton, Steven Defour, Patrick Bamford. Yellow Cards: Jeff Hendrick, Ashley Barnes.